Both USDA’s Food Safety and Inspection Service and the U.S. Food and Drug Administration oversee food product recalls—the removal of risky food products from the U.S. marketplace. 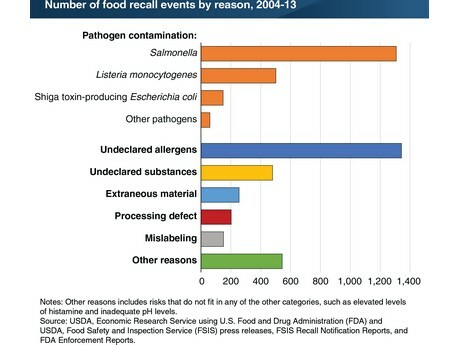 From 2004 to 2013, there were 4,900 food recall events in the United States involving a wide variety of foods. Most of these recalls were initiated because of possible pathogen contamination (41 percent) and undeclared allergens (27 percent). Pathogen contamination is the discovery of disease-causing microorganisms, such as Salmonella and Listeria monocytogenes, in a food product. Undeclared allergens refers to the failure to declare on a food label one of eight major allergens: wheat, eggs, peanuts, milk, tree nuts (e.g., almonds, pecans, and walnuts), soybeans, fish, and crustacean shellfish. While the number of recalls due to pathogen contamination did not increase significantly from 2004 to 2013, the number of undeclared allergen recalls nearly doubled. The passage of the Food Allergen Labeling and Consumer Protection Act of 2004 (effective January 1, 2006) likely played a major role in the increase in the number of undeclared allergen recalls. The statistics for this chart are drawn from the April 2018 ERS report, Trends in Food Recalls: 2004-13.